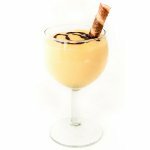 National Vanilla Pudding Day is celebrated annually on May 22. Enjoy a nice cold bowl of vanilla pudding to celebrate the holiday. Vanilla pudding has a very long history and he evolved from a meat or fish dish. Arabs had a pudding-like dish of rice and almonds, that could be traced to the 12th century, but it is believed that is had appeared even earlier. The recipe of this dish was translated and it appeared in medieval Europe. Over ages the dish evolved into French blancmange, that was enjoyed Europe's wealthy families. The original ingredients for blancmange were milk, sugar and shredded capon or fish. Later meat was dropped and blancmange evolved into a dessert made with milk and eggs. In the 19th century arrowroot and cornstarch were added to the dish, that made the modern pudding. Jelly-based pudding is the final stage of vanilla pudding development. Jell-O launched the line of instant puddings in the 1950s and advertised this product as the busy-day dessert. No matter what kind of vanilla pudding you prefer, homemade or bought in the store, both are good for the holiday. And if you want a special treat, pair pudding with chocolate or fresh fruit.